Fastned took to the interwebs to loose some facts about the impact its fast charging network has on the grid. With Fastned stations operating exclusively at 50kW and above, its network is a great case study for what large numbers of fast charging sessions might have on the grid. It opened up and shared information from more than 100,000 fast charging sessions over the last 5 years – and the results are interesting. Before diving into the data and analysis, it is worth premising the discussion with a quick note about electric car charging. The world is in the middle of the greatest crisis it has ever known – climate change. Most of what we do here at CleanTechnica is focused on sharing solutions and progress made with those clean tech solutions to avert disastrous climate change. It is not certain that humanity will be successful in this effort. Electrifying transportation is a means of decoupling emissions from the point of use, moving them to the centralized, more easily managed electrical grid. Fast charging helps move that forward, but let’s not lose sight of why it’s really important, because it goes beyond just driving torquey, quiet cars packed with fun tech. Phew, that was heavy. Thanks for sticking with me. Getting back to fast charging, with its exclusively fast charging network, Fastned is in a unique position in the world to understand where we might be going and what impact that behavior will have on the electrical grid as we know it today. Looking to where the ball is going and not just where it is today helps us to understand what changes can be made to support the vast array of new technologies coming online over the next few years. Early movers like Fastned make for great case studies as to what this future we’re all working towards could look like. The first benefit of a fast charging system is that they tie directly into the medium voltage grid. That shifts the load from the less durable low voltage grids and makes it easier for grid operators to manage and respond to EV charging demands compared to distributed level 2 charging. A single 1 megawatt (MW) Fastned charging station equates to roughly 100 Level 2 chargers. Consolidating all of that charging capacity into a single station means securing a single permit instead of dozens, cutting the non-value add overhead spending, effort and lead time to stand up the stations. On the other hand, fast charging causes larger spikes in demand than level 2 charging, pulling more power down in a shorter period of time. That spike in usage typically results in steep demand charges that help grid operators respond to the larger, faster changes in electricity usage. This characteristic of fast charging stations make them ideal candidates for stationary storage. Installing batteries at a fast charging station can be used to dilute the electrical demands from the station over a longer period of time. To the station operator, that translates to less demand charges from the grid operator. In periods of low station usage, the batteries can be used to stabilize the frequency of the grid, respond to increased grid demand with extra supply and even be managed as a demand response unit as they charge up. Fastned does not currently have any storage at any of its charging stations but is working towards building out a pilot site in Germany and another in the Netherlands, thanks to an agreement with Lecleanché last year. It is also building out a charging station in Newcastle in the UK, where Fastned will work with Newcastle University to explore the nuances of fast charging on the grid and to determine ways that it can more effectively work with grid operators moving forward. On the grid side, installing batteries at a fast charging station has the potential to shave off those peaks in usage that result in demand charges. It is easier for a grid operator to respond to more gradual increases in usage so the batteries are definitely a win on their side of the equation as well. Fastned shared data from usage on its network broken out by the percentage of charging sessions per hour. We have requested this in power consumption and will update this article if/when we hear back, but for now, this paints one part of the picture. Working with what we have, the graph below instantly draws out the parallel curve we see with solar generation. Percent of Fastned charging sessions in each hour of the day. As more and more photovoltaic solar generating capacity is added to the grid, the challenge of balancing the grid is shifting to discussions about how to balance the electrical demands of customers into peak solar production periods. The chart above makes a strong case for fast charging being an appropriate tool for utilities to look to as a means of absorbing some of the excess solar generation during the day. Beyond that, being able to match up plug-in vehicle charging with solar production means drivers are able to essentially drive on sunshine, all but eliminating the carbon footprint of their vehicle’s energy consumption. Solar generating potential trend in a single day. The two curves may look the same but there are more factors than just the general shape of usage. Generally speaking, solar generation happens from ~8am until about 6pm. Looking at the fast charging usage graph, we can see that charging begins to taper off around 6pm but still remains rather high throughout the evening. That trend will accentuate the infamous duck curve in grid electrical usage that represents the bump in usage associated with workers returning home and starting some activities at home that result in higher power usage after the broader trend of workplace usage throughout the day settles down. Having said that, the two curves do bear some similarities and with some strategically deployed energy storage, the two make for rather complementary bedfellows. The ‘duck curve’ graph highlights an electricity usage spike in the evening hours. Installing stationary energy storage is clearly a good option to mitigate the added strain that fast charging stations will put on the duck curve from a technological standpoint. As discussed above, installing energy storage mitigates many of the sharp edges that come with fast charging stations, including the duck curve. The amount installed at each fast charging location can be tuned based on the grid it is connecting to, the size of each charging point, and over time, the usage habits at the station. Demand response technology also holds promise as station operators can add the ability to choose whether they want to pay more for a faster charge, the cheapest charge, to have their vehicle charged by a certain time, or to charge up with only electricity generated from renewable sources, etc. Adjusting pricing to give consumers more control over their finances and their carbon footprint also has the potential to minimize the impact fast charging stations have on the grid. The future is bright for plug-in vehicle charging, and as early movers like Fastned are proving, high speed vehicle charging isn’t a universal recipe for grid failure when it is done right. 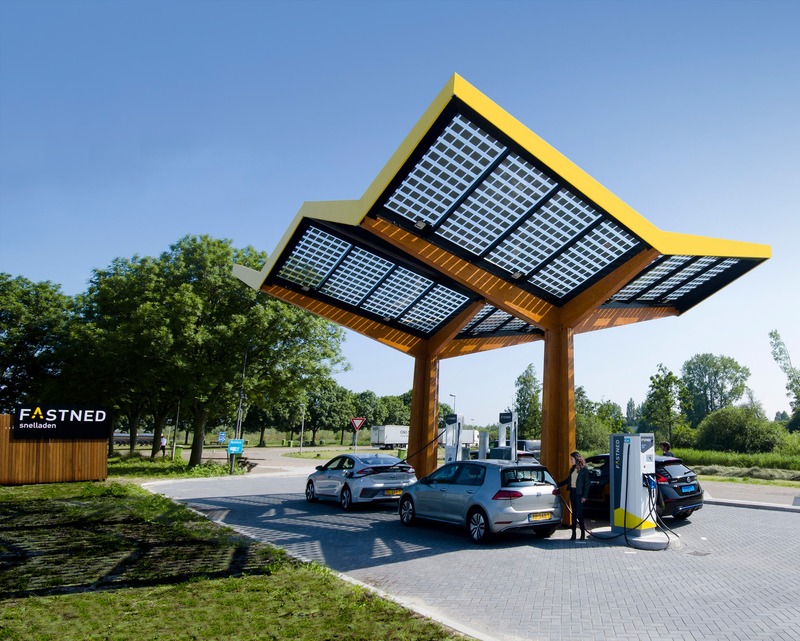 CleanTechnica has reached out to Fastned to get more information about the power draw from fast charging sessions throughout a day and the amount of energy storage Fastned has deployed. We will update the article if/when we hear back.